Planning a wedding, but your future husband refuses to let you rock your favorite comfy hot pink Crocs down the aisle because of, you know, social norms? Well, you’re in luck. Crocs, recently described as the “indestructible cockroaches of the fashion industry,” just released a high-heel version of its iconic, amphibious clogs. Crocs launched back in 2002 as a brand that was heavily focused on function and comfort alone. Clearly. The founders wanted to create a water-friendly boat shoe to be used for outdoor purposes. But to some surprise, these not-so-cute shoes went viral, and quickly became must-have footwear for restaurant and hospital workers who are on their feet all day long. And since the shoes weigh anywhere from 11-15 ounces, we get it. But over the last few years, the brand has been trying to shed their old skin and win over the slightly more fashion-forward customer. The brand released a collaboration with Balenciaga in October, which did nothing but trick out the rubber clog to make it a little worse and skyrocket the price. 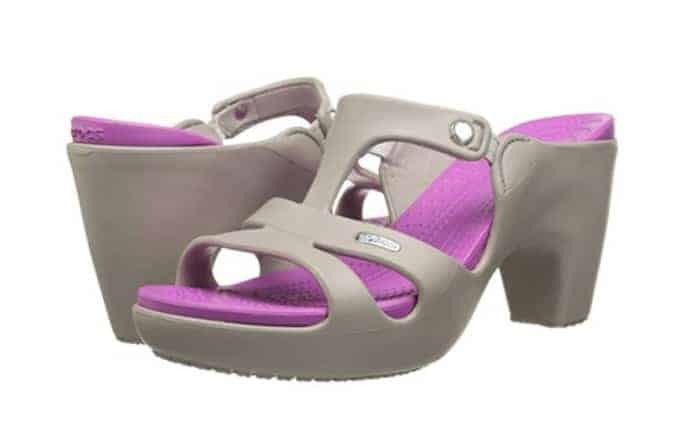 The brand has designed heeled versions of their shoes in the past, but this time, Crocs are all in. For whatever reason, the $55 shoes are literally flying off the shelves. Bridal parties, rejoice! Matching heels for everyone!